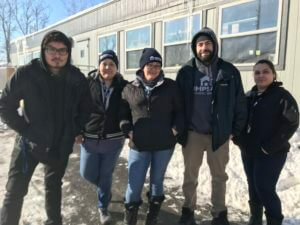 “The eight-week effort of creating the Navigation Center and assisting Native community members with their move to the temporary shelter space was an unprecedented mobilization. The City of Minneapolis, fire department, police department, waste management, MN DOT – the highway department, Hennepin County, all of the Native organizations and social service agencies surrounding the work — everyone came together to support this large community of people as we helped them move to the Navigation Center. The mobilization involved all the pieces that had to be put into place. All the zoning, planning, and permits. The health inspections. The fire inspections. The Navigation Center is a Native-led, collaborative community response. 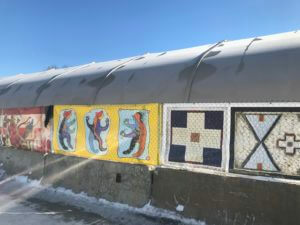 Red Lake Nation, Metropolitan Urban Indian Directors, Hennepin County, the State of Minnesota, shelter providers in the Minneapolis shelter collaborative, including Simpson Housing Services, and several other organizations united to provide outreach to the primarily Native American community living at the Franklin-Hiawatha encampment and develop plans for the Navigation Center. Designed as a low-barrier and service-rich temporary shelter for adults, the Navigation Center provides a safe and dignified transitional housing option for more than 120 community members who previously lived outdoors at the encampment, respectfully known as the Wall of Forgotten Natives. The Navigation Center was constructed over an eight-week period. Guests were welcomed into the Navigation Center during the latter half of December 2018. 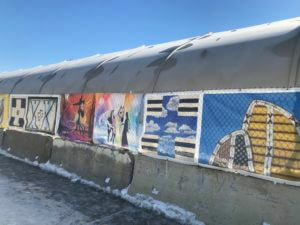 “The Native community made this big change happen. All the people who had been at the Wall — they had been homeless for a very long time, scattered all the way around town. They decided to come together and take a stand. Wilder Research’s 2015 Homelessness Study highlights the disproportionate impact of homelessness in the lives of Native people: 1% percent of adults in the overall Minnesota population identify as American Indian, but 8% of homeless adults in Minnesota identify as American Indian. This racial disparity in housing stability stems from a history of discrimination and trauma for the American Indian population that extends to present day. Executive Director Steve Horsfield views the Navigation Center as an opportunity for the broader community to come together to provide shelter and support in a culturally competent manner. Click here to learn more about honoring Native American history. “We have a talented staff that is committed to building relationships with guests, helping them overcome barriers, and providing connections to housing and services. Early in the planning process, Simpson Housing Services was selected by the collaborative planning team to provide shelter operational support for the Navigation Center. Given Simpson’s 37 years of experience providing housing, support, and advocacy to people experiencing homelessness, the agency was recognized as a leader in the field, strongly suited to serve in this role. Simpson’s board of directors approved the agency to be a part of this partnership and serve in this operational capacity at the Navigation Center. 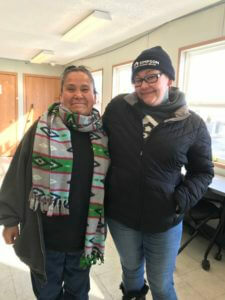 The decision was guided by their shared belief that helping people experiencing homelessness at the Franklin-Hiawatha encampment during the harsh winter months is the right thing to do. Central to the successful operation of the Navigation Center has been the selection of its staff. To date, 31 Simpson staff members, including three case managers, provide support at the temporary shelter. Many Navigation Center staff members have connections to Native American community members and previously provided outreach at the encampment. Simpson trains and coordinates volunteers who serve the evening meal at the Navigation Center each day. Breakfast and lunch are self-serve. To date, 100 volunteers are part of a dozen groups serving meals. “Everyone has a right to have a safe place to sleep regardless of who they are, where they come from, and what they’re struggling with. What happens at the Navigation Center? The Navigation Center guests reside in heated, indoor structures with cots and partitioned areas arranged by guests for sleeping and daily living. Just a few steps away, two large trailers house a dining hall for meals and office space for guest meetings with shelter staff and community resources. Buildings with heated bathrooms and showers are conveniently located on the premises. Three meals as well as snacks are provided for guests each day. Bedding and hygiene supplies are also available. The Navigation Center’s low-barrier approach incorporates guidelines that create a safe, welcoming, and respectful living environment for guests. The temporary shelter is open 24 hours per day, seven days per week. Individuals living at the Navigation Center are allowed to leave and reenter the premises according to their own schedules instead of predetermined times. “Since the beginning, safety has been the focus of the Navigation Center. We have been successful in getting people into a safer environment. We talk to people about taking care of themselves in safer ways. Our best strategy to build safety is through our staff. And our relationships with the police and fire departments continue to be absolutely vital to ensure the safety of our guests,” says Steve Horsfield. Building working relationships between staff and guests is an important part of what happens day-to-day at the Navigation Center. “It’s really important just to be present and available. It’s important to be welcoming — to say hello and greet guests by name. To always put guests’ needs first. We provide support when it’s needed and let people know that they are safe where they are. And we let them know we want them to be here rather than outside,” says Marian Wright. As the staff becomes familiar with an individual’s needs and goals, they can offer connections to community resources, helping each person create his or her own path of increased stability. “Whatever we can do to help people become more stable than they were before they got here will be worth it. Whether it is getting them connected back to their doctor, getting them back on their medication, or getting their ID, birth certificate, or social security card. Having a Rule 25 [chemical use assessment] done, getting into treatment, applying for an apartment. Getting an eviction off their record. The Navigation Center — and all of Simpson Housing Services’ shelter and housing programs — operate from a dual philosophy of Housing First and Harm Reduction. The Housing First model is based on the concept that people first need a stable place to live before addressing other issues such as substance use, mental health concerns, employment or other barriers. Navigation Center staff utilize a harm reduction approach in their working relationships with guests, introducing helpful steps aimed at reducing risks of an individual’s behavior. Harm reduction is often applied to people who actively use drugs. Guests who use drugs or alcohol are welcome and have access to different kinds of supports designed to help them stabilize and reduce harm associated with substance use. Through our community partnerships, we offer harm reduction strategies that enhance the safety of the Navigation Center guests. Guests may voluntarily connect with on-site community resources focused on stable housing, health care, mental and chemical health, and other needs. The Navigation Center is inclusive of traditional Native practices, and on-site Native navigators work closely with guests to discuss needs, offer clinical support, engage in prayer and ceremonial work, and access other culturally competent resources. Community resources are added at the Navigation Center based on guests’ needs and interests. The Navigation Center is a collaborative effort to provide safe, temporary shelter for community members. By offering support and connections to community resources, it is hoped that each guest will experience enhanced stability and well-being, now and beyond the Navigation Center. The Navigation Center will remain open for guests through May 2019. In June, Red Lake Nation plans to break ground for permanent housing on the site. American Indian Community Development Corporation has two navigators on site. Minnesota Indian Women’s Resource Center has two navigators on site. Livio, a mobile health care services provider, is on site on weekday afternoons. Avivo is working on moving people into housing using the state-funded housing support program. Hennepin Health provides on-site health care resources one day per week. Hennepin County Access Team has a staff person on site five days per week helping with the navigation of county systems. Hennepin County Healthcare for the Homeless offers mental health and psychiatric services to Navigation Center guests on a weekly basis. We are currently not accepting donations of supplies at the Navigation Center. For volunteer opportunities at Simpson visit our volunteer page, or please consider making a donation at Donate Today.